More Death Please We’re British! Together these posts outlined my personal response to the newly opened visitor centre at Stonehenge and visit to the stones, noting the neglect of the afterlife of the monument and its landscape after the Early Bronze Age including the Roman and Anglo-Saxon activity at and around the site. More recently, I got the opportunity to go within the stones and wrote a blog about the experience here: Why are there jackdaws at Stonehenge? During the same visit, I got to go back to the Visitor Centre and reflect on it again. Things have changed in a number of ways since my first visit. The military-style land trains have been replaced by less martial liveried buses, and the small ‘Neolithic village’ area has been finished. 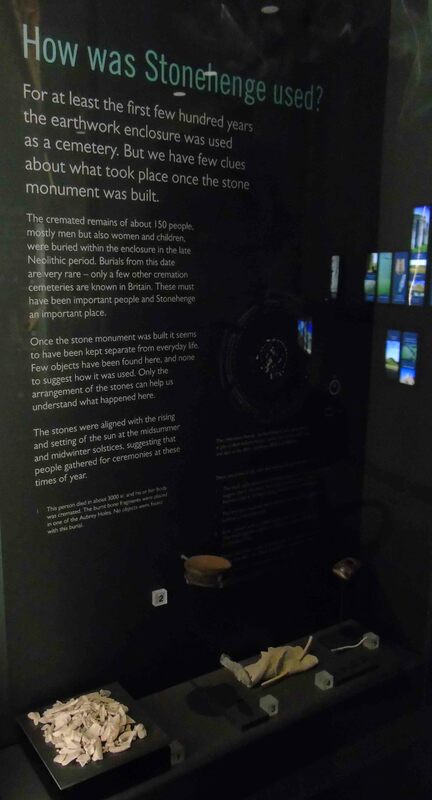 Also, the temporary exhibition on the reception of Stonehenge has shifted and includes a range of material cultures about the reception of Stonehenge in the 19th and 20th centuries: this was fabulous and deserving of a visit in its own right. I also got to look over the permanent elements of the exhibition again, including the fabulous visual reconstructions of Stonehenge through the ages, the video projected onto the long wall of the landscape of Stonehenge through time, and models of the phases of the monument. I also reflected again on the human remains on display, building on my post More Death Please, We’re British. In the new Visitor Centre at Stonehenge there are three sets of human remains. My point in my previous blog post was that (despite objections from some) I fully support the display of human remains in this context. The two sets of the remains I discussed in previous blogs feature memorable and striking engagements with unburnt and articulated human remains. Their contrasting impressions reveal something of the rich variability in the mortuary practices of prehistoric communities in and around Stonehenge and give single ‘ancestral’ figures within the educational context of the displays. However, I was also suggesting that if we are going to use the human dead to tell the story of the human past at Stonehenge and its landscape, three sets of remains is simply insufficient. This is because Neolithic and Early Bronze Age mortuary practices have many dimensions that simply cannot be adequately communicated by small arrangements of the human dead. Also, it is because many dimensions of these periods’ death rituals involving multi-staged treatments of the body after death, in which bodies were broken apart, circulated and re-arranged: single bodies cannot tell these stories. Hence I call the blog: More Death Please We’re British. 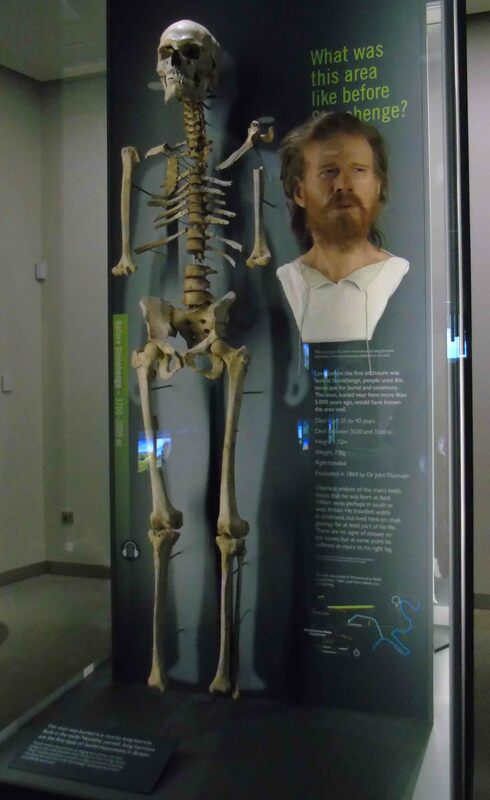 The ‘Before Stonehenge’ remains are from the Winterbourne Stoke long barrow and include an adult male who is juxtaposed next to a facial reconstruction of how he might have appeared. Informative and striking though this is, it is simply impossible for one skeleton to explain the complex process of burial and the rearrangement and removal of human bones that take place in early Neolithic earthen and megalithic chambered long barrows and the communities they represented. The ‘After Stonehenge’ dead are represented by a flexed Beaker inhumation grave with accompanying Beaker sherds and artefacts plus a reconstructed Beaker vessel. The rise of inhumation as a burial practice of this nature is communicated more directly through an individual skeleton, but the choice again of a single male adult skeleton gives us a second male prehistoric ‘ancestor’ and no sense of mortuary variability or community identity. Also, even long into the Early Bronze Age, the ‘single grave’ involved many instances of re-opening and re-arranging graves, and/or burying partial bodies. Again, my complaint is not the presence of human remains or the careful design of their presence, just a concern that single bodies alone have a restricted ability to reveal community and variability in past mortuary practice. These two sets of human remains catch the eye and are richly informative. They are anatomically arranged and unburnt and therefore ‘look’ human. 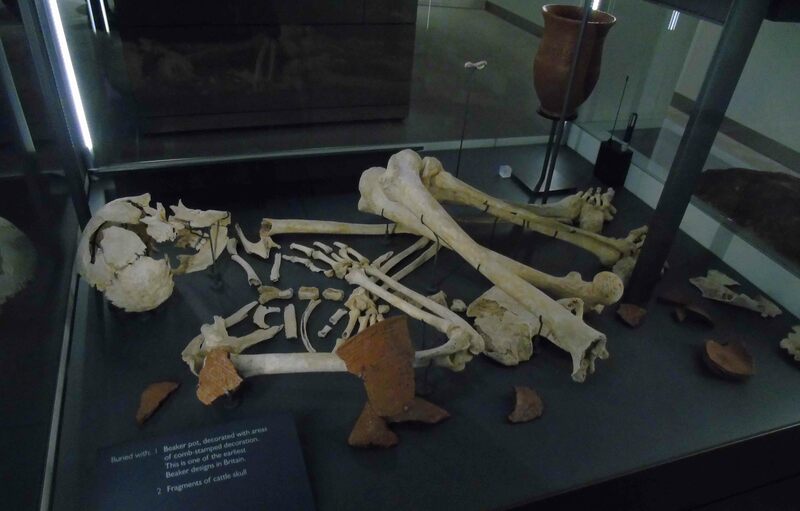 However, the ‘During Stonehenge’ human remains contrasted with both of these articulated remains. Together with a range of cremation artefacts associated with the burials in the Aubrey Holes the cremated remains are key to Stonehenge’s interpretation. I am co-editing with Melanie Giles a new book published with Oxford University Press this coming summer called Archaeologists and the Dead. In it, 20 chapters explore different dimensions of the relationship between mortuary archaeology and contemporary society, exploring the public and popular dimensions of field investigations, museum displays and writing and visualising death in the human past. In this book, I dedicate a chapter to considering the many challenges and possibilities in displaying the cremated dead in museum and heritage context. It is called ‘Firing the Imagination: Cremation in the Museum’. In this chapter, I contend that serious attention to the ubiquity, variability and potential for rich stories to be told from cremated human remains are repeatedly neglected by museum archaeologists. Using a range of museums from the UK and Scandinavia, I suggest a range of strategies for displaying the cremated dead. I also identify some of the repeated problems with communicating process and variability in past mortuary practice within the artist’s reconstructions, captions and arrangements of artefacts and bones often put on display. This argument has a bearing on the display of the cremated dead in the Stonehenge Visitor Centre. The third category of human remains on display at Stonehenge are the most important in many ways. Under the title ‘How was Stonehenge used?’ they relate to the cremated remains found in the Aubrey Holes just within the henge bank and ditch as well as in the henge ditch, primarily on the SE side. As such, the burials relate to those interred at Stonehenge during its earlier stages, around 3000 BC. These individuals were cremated – an unusual mortuary practice at the time – and therefore perhaps belong to a special status group, perhaps even religious and/or political leaders. Whoever they were, they became a community in death. The remains come from c. 150 people, mainly men with some females and juveniles. The artefacts found with the cremated remains are very special too and include a fabulous mace-head (a ‘wand’ used by religious leaders? ), small pottery vessel that might have had a role in incense burning (perhaps as a part of cremation ceremonies) and bone pins/skewers (that were perhaps used to tie together clothing or shrouds). There is even a flint that is possibly a strike-a-light for cremation pyres. If these interpretations are indeed accepted, then more than any other display I can think of, these artefacts reveal dimensions of the mortuary practices that culminated in the creation of cremated human bone. And yet the cremated bone is a small square pile of clean white bone. What more is there it say? The caption simply says these are burnt bone fragments and no artefacts were found with this particular burial. No attempt is made to evoke the context of discovery (what is an Aubrey Hole I wonder?) and no attempt is made to explain what an ancient cremation ceremony involved in terms of materials, technology and ritual process. 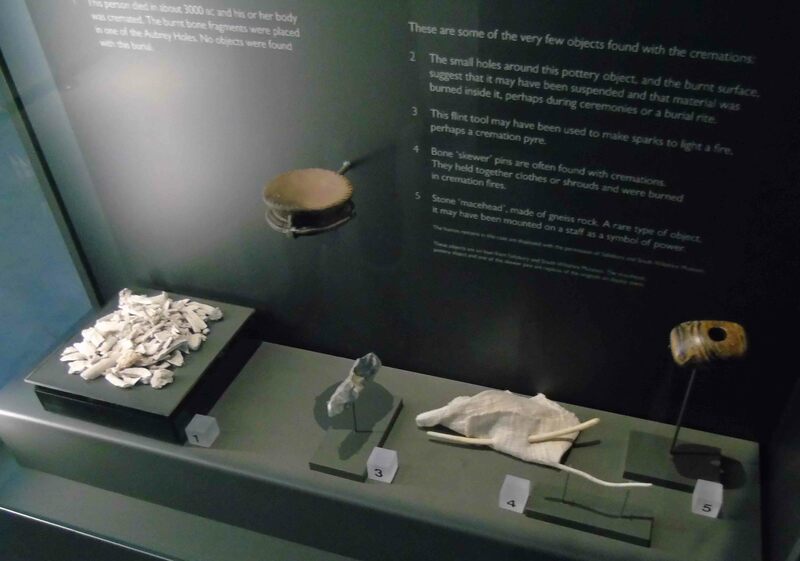 Despite this fascinating display: what do visitors really get to understand about the Neolithic funerary process, variability in mortuary practices, and contexts of deposition, associated with these cremated remains? How do they sense the fires involved and understand the human lives behind these fragmented white bones? This display epitomises the broader challenge many museums face in dealing with cremation: cremated human bone doesn’t ‘look’ human and its fiery transformation is often missing from displays. So, as in my forthcoming book chapter, I pose the question: how do we reignite these remains in the public’s imagination? How do we bring fire and ritual back to these bones? How do we ‘burn’ Stonehenge? Previous Previous post: Why are there jackdaws at Stonehenge? I like seeing the facial reconstructions, even just the “bare” bones in exhibits because I think these displays need the reminder that people were involved in what are now museum displays. The more connections/explanations that can be made the more I think the general public will be drawn in to support. ‘If these interpretations are indeed accepted….’ Yes, I’ve had a series of questions in mind – for instance, when taking children to museums and heritage centres. Do these material reconstructions change frequently, with displays changing upon the arrival of each new theory and/or exhibition manager? Does our understanding – of prehistory in particular – often depend which reconstructions [including TV documentaries] were seen, and remembered, by each of us as a child? If considerable self-restraint is not exercised by the high-flying academic as well as by the exhibition curator, are the rest of us being influenced more by the imagination – and enthusiasm – of the modern interpreter than by a reflection of the [uncertain] reality? In this present age when ‘time is money,’ does commercialism tend to detract from our understanding of the truth?